But really, they need us so badly. Sometimes they are just so helpless. And despite all their mistakes, constant questions, and totally un-funny-but-never-ending knock-knock jokes, we can’t help but love them more than words could ever describe. Now, it was the first day back to school. We were back home, and I was in the kitchen, mind wandering to stresses and anxieties. Grown-up things. “God? What do I do about this? How do I handle this?” I somehow felt like I wasn’t being heard. I felt like I bring the same stresses and questions to Him, and I get no response. My eyes started to well up, just as Annalise walked in the room with a nervous and stressed look on her face. I stopped her and asked her what she was talking about. I work at her school, and I’m pretty positive no one is requiring make-up. “It’s true, Mom! They said this Friday is make-up Pajama Day.” Ahh. Don’t you just love how literal 6-year-olds are? It was in that moment, as I started to explain to her that she had misunderstood what they meant by “make-up,” I realized that this was a perfect picture of how I must be to God. Annalise’s 6-year-old worries were real to her. They seemed so big and impossible. Yet, to me, they were no big deal. In actuality, they weren’t a problem at all. She just didn’t fully understand. How many of my problems – my real human 35-year-old problems that seem so big and impossible are no big deal for God? How many of my problems aren’t even problems at all? How many of my worries and anxieties are wasted worries and anxieties, because in actuality, I just don’t see the big picture. It was as if in that moment, when I was kissing my girl’s head and saying “Don’t worry, sweet girl. I got this.” God was doing the exact same thing to me. In fact, He says it all the time. It’s found all throughout the Bible. Jeremiah 29:11. Joshuah 1:9. Romans 8:28. Matthew 19:26. Just to name a few. After lying dormant for a full week and a half as we all began the school routine, it appears every toy in the house has now awoken and burst forth in one fell swoop onto the living room floor. I can not walk through, which is totally fine with me, because I am wiped, I tell you. Wiped. Spent lots of Saturday and Sunday recouping from the first full week at a new school and the first full week as a mom to a school-age kid. Dropped off the eldest for her first full day. Waited at the bottom of the few stairs next to her room and watched as she quietly followed her teacher’s directions and found her place in line. Listened to the clicking of the camera next to me and the pounding of my own heart, waiting for her to turn and say “Bye, Mom! I love you!” Waited and breathed. Breathed and waited. She never turned. 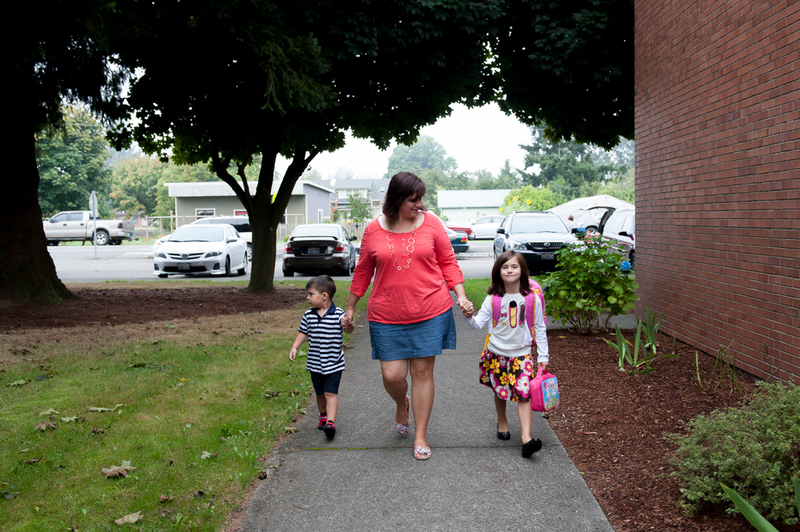 She filed right into her classroom without a hug, a kiss, a good-bye, or even a smile. The teacher poked her head out and said cheerfully, “Ok, you can all go and cry now.” Oh boy, did I. The whole way home. “Matt, I didn’t even tell her I love her! I thought we’d have a chance to give her a kiss! I didn’t give her a kiss!” I sobbed. He comforted, or tried to. I just kept crying. 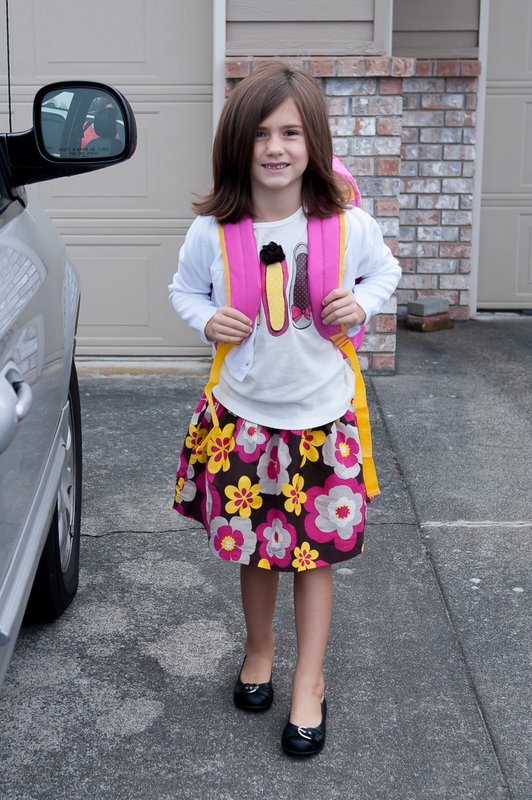 GIRL NEWS: Dropped her off for her first full day of Kindergarten. This time, we didn’t get to stay. Cried like a baby on the way home. Why did the first day have to be on my day OFF? There will be no checking in on her. Although, I may or may not have texted some staff members to peek in and/or stand guard over her. Just one question: HOW DO YOU PEOPLE DO THIS EVERY SCHOOL DAY ALL YEAR FOR THIRTEEN YEARS? I will now hug each parent as they leave my classroom. I’m with you. Solidarity. You are the bravest of soldiers to have a little bit of your heart rip out each day. BOY NEWS: In the meantime, I’m having a day with my boy. We’ve played cars, 4 wheelers, and Batman. He took me on a date to Woods. Opened doors, ordered for both of us, and paid with his very own Woods Card he got for being an awesome ring bearer. Total Stud. And also, this: If you don’t hear Jacob talk for the rest of the year, it might be because he’s used up all his words in the last 3 hours. How thankful I am for Mommy Mondays. But if you notice I’m in a daze on Tuesdays, just know it’s likely because my ears are grossly overworked and shut themselves right down somewhere around 2pm the day before. Today, I am grateful for: Time with my boy. Mommy Mondays are the best, even if my ears do get tired! Drop off was a little easier. Teared up a bit, but not as bad. Made for darn sure I gave her a kiss and hug good-bye. Geesh. Told her I love her, and reminded her who walks the halls with her. Headed home for a bit, then back to school for my Tuesday afternoon shift. Ran into her in the hall as I was headed to the art room. Busted my buttons with pride when she waved and hollered from her class line, “Hi, Mommy! I love you!” Am I the only teacher-parent who dreamed of this moment? Cried happy tears walking back to my classroom. Today, I am grateful for: The dream come true of having my girl in my own school, the security of having her down the hall, of knowing her teachers and the staff, of opportunities to see her throughout the day. Drop off was the hardest this day. Not because of my own heart, but because of her tender little brother’s. In the car on the way, the sweet boy next to her got an overwhelming sad face (if you know him, you know his emotions are perfectly expressed in his face.) I was already sad seeing his look in the rear view mirror even before he’s said a word. Then he looked at his big sis and said, “Sissy. I dist miss you so much when you’re gone. I don’t want you to go to school!” His eyes filled with tears, and he squeaked out, “Will you dist hold my hand on da way?” Heart Break City. Massive tears and an even more massive lump in my throat. Spent much of the rest of my day wondering if I should be homeschooling just so as not to break my youngest boy’s heart each day. Today, I am grateful for: Kids who love each other so much! They really, really do! Even if I did need to remind them of this later in the day when they fought over which My Little Pony shoes they got to play with and where to sit at the dinner table. Jacob: Mom! Here’s the plan. We are gonna play trains, then have lunch and cookies, then play trains some MORE. Me: Nope. Sorry, Bud. The plan is we are gonna eat lunch, take you to the babysitter’s, and I’m headed to work. Jacob: Sorry, Mom. I got bad news for ya. The plan is off! Today, I am thankful for: Modern medicine! Antibiotics! Working half-time so I could take my daughter to the doctor without writing sub plans! A boy who knows what he wants – play time with mom – and makes me smile all the time. My full day at work. We started the morning saying good-bye to Daddy, because he was headed out of town overnight for a wedding in Bellevue. Tears from both kids in the car as we drove toward Jacob’s babysitter. More tears on the way to school as she cried for her Daddy. Spent the morning trying to work in my classroom with a 4 foot leech attached to my side and standing on my feet. Suddenly, I wasn’t as sappy and sad as I was irritated and impatient. Funny how that can turn so quickly. We got in our PJs and climbed into my bed, all 3 of us. I sat up in the middle with a little angel leaning on me on either side. “Momma, will you sing us a song?” she asked. I quietly sang the first song that came to my mind: Great is Thy Faithfulness. …Thou changest not, Thy compassions they fail not. I looked over at each of my babies. …Great is Thy faithfulness, Lord, unto me! You know those parenting moments you don’t really look forward to, but you know are coming and there’s nothing you can do about it? Moments like when your child gets his/her driver’s license. Expected, a good thing in many ways, but also terrifying and maybe a bit sad as your “baby” is nearing adulthood. Moments like when your child moves out of the house to go to college. I cry just thinking about it, and mine are only 5 and 3. Moments like the day your son or daughter comes home and says they’re getting married. Hopefully, you’re elated and this is all a very wonderful thing, even though it might be very emotional at the same time. Tonight, I got to witness one such moment. One of those “I knew it would happen sooner or later, but how did this happen so fast?” moments. Hours later, I’m still laughing picturing his look of shock and total bewilderment. Prayers appreciated. Looks like Matt is gonna need them. Some days, the reality of how old I am hits me. Well, once I can remember how old I am, it does. This morning was one of those mornings. Today was a family day. No work. No computers. No cameras. Just me, the Hubs, and the kids. We were headed to the Pacific Science Center. I remember going there as a kid. I remember some of the same exhibits (Touching the sea life? Oh yes. Loved it.) I remember family days and car games and all the stuff we were going to be doing today. And as I was getting ready and remembering all these things, I started to feel old. The kind of old that starts with this thinking, Who allows young people like me to be a parent??? Don’t they know I’m not ready for that? Then changes to, Oh wait. I’m not young. I’m in my thirties. I remember my parents being in their thirties. Am I the only one? The only one that remembers things from their childhood and feels O-L-D when observing said things being repeated in their kids’ lives? The only one that has these moments of panic where I realize I’m not just out of high school? But then begins to do the math and suddenly realizes I’ve been out of high school longer than all the years I was ever in school… including pre-school, but excluding college – or at least some of college. This morning, this thought was interrupted right about then by the sounds of children fighting, reminding me that however long I live, I have a job to do now. Which makes me feel just a little bit younger. The family day was great. The science center was the most crowded I’ve ever seen, but it was still enjoyable. Look at me! I’m not a grumpy old lady! We stopped for dinner on the way home. At the noisy restaurant, we saw a man about in his 60s working with the hostess at finding the perfect table for himself. He apparently requested a quieter area, to which she replied, “I’m sorry. We don’t have an area designated for quiet dining.” And then she sat him directly behind our booth. A recipe for disaster, if you ask me. (Maybe she planned it that way. Just to annoy him for his snooty request.) And despite Annalise’s bumping the back of the booth (also his back of booth), he never once asked us to quiet down or stop jiggling his seat. So even though the waitress spilled Matt’s coffee and dropped a knife on Jacob and brought Matt the wrong entree (he ate it anyway, also a very “not-old” thing to do), and even though Jacob dropped the ice cream right off his spoon six times – three of those times right onto my lap – I’d consider the dinner a success. And I left feeling sorta young again. And sticky. Young and sticky. Which also makes me cry. 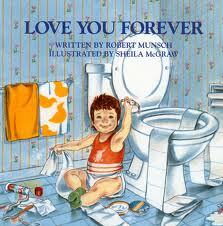 And I remember this book making my mom and my Auntie Jill and Trish cry. …And so now I feel old again.